CabFare says it has an advantage in that people hail taxis on the street — something they can’t do with Uber and Lyft. As Boston’s taxi industry gets run over by ride-hailing companies like Uber, an Australian company says city regulations are preventing it from offering a new digital tool that could help cabbies better compete. 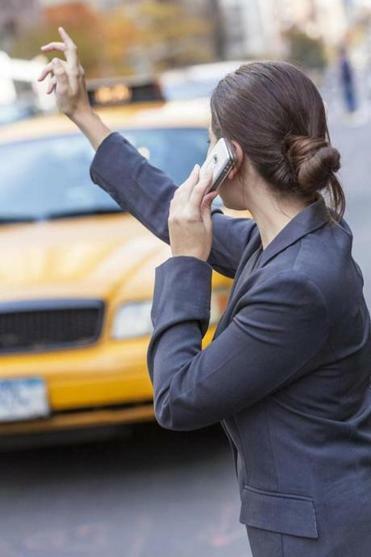 The company, CabFare, focuses on the one area of the business in which taxis still have an advantage: rides hailed directly from the street, which Uber and Lyft cannot offer under Massachusetts law, and rides that begin at taxistands. The company’s app allows a passenger, once inside a cab, to automatically record the trip and pay the fare electronically, via a Bluetooth connection between a smartphone and a device the company is distributing to participating drivers. “You deliver all the things you get with a ride-share booking app for when you pick up a cab on the street,” said CabFare’s founder, Arthur Argyropoulos. CabFare said that it intends to charge drivers 30 cents per ride — and not charge anything during beta testing. Cabbies pay a fee of up to 6 percent for fares paid by a swiped credit card. But Boston regulators won’t allow CabFare to be used to pay for taxi rides because the company is not using one of the two approved credit card processors for city taxis, said Lieutenant Thomas Lema, who runs the Boston Police Department’s Hackney Carriage Unit. Instead, CabFare customers use mobile payment systems such as Apple Pay, Android Pay, and PayPal, which are not authorized by the hackney division. Lema said he is hesitant to let taxis use those mobile payment systems because it could complicate the streamlined record of cab transactions that the approved credit card companies share with the city. In late February, the hackney unit issued a memo warning cab drivers not to use the app to process payments, and that any driver who did so would face a 30-day suspension. But Lema said Boston cabbies can use CabFare for its nonpayment features intended for passenger safety, such as route tracking and the ability to share your trip data with a friend. Two other smartphone apps that passengers can use to hail and pay for cabs are owned by Verifone and CMT, the only companies approved to process credit card payments for Boston fares. Other taxi apps in Boston owned by local cab companies only allow for users to book rides, not to pay for them. Before developing its mobile app, CabFare installed traditional credit card payment devices in taxis in Australia. Lema suggested the company could get those systems approved in Boston and install them in cabs here. Or, he added, CabFare could seek partnerships with Verifone and CMT to process payments. But Argyropoulos said he developed the technology to bring mobile payment systems to cab drivers, rather than have them rely on traditional credit card processing companies and devices. Argyropoulos said he is hoping to convince Boston to allow the mobile payment systems, and said CabFare would share its trip and transaction data with the city if his payment system is approved. The stalemate has left some in Boston’s beleaguered taxi industry frustrated. Argyropoulos is testing CabFare in the United States where Uber is prevalent and targeted Boston first because he has personal connections here. The company distributed the Bluetooth devices to more than 200 Boston drivers in February. In late 2016, the Cambridge License Commission reached out to CabFare as part of a campaign to bring new apps to the taxi industry, said chairwoman Nicole Murati Ferrer. In March, the commission authorized the use of CabFare among that city’s 200-plus taxis. CabFare is a modest solution for cab drivers. Among its challenges is to convince consumers that a hailed taxi ride with a digital connection is more convenient than simply waiting a few minutes for an Uber or Lyft driver to show up on demand. Donna Blythe-Shaw, a former union representative for Boston taxi drivers who still advocates on their behalf, said the issue highlights a fundamental problem with the industry: that even as taxi revenues plummet, regulations make it difficult for owners and drivers to try anything new.